Google Maps keeps evolving, expanding the ability to drill down into granular detail. The latest updated trick? 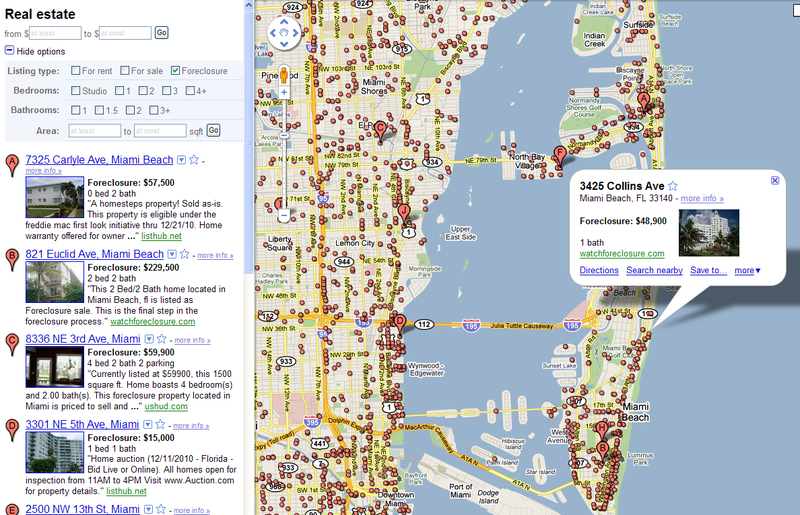 Mapping foreclosures for sale. This great and terrible Google trick has been around at least since 2008 — but it seems to have become much more robust earlier this year (See Dregs of the Future‘s post in January 2010). 1. Punch in any US address into Google Maps. I wanted to demonstrate the full extent of Foreclosures in the US, so after setting GMaps on foreclosure listings, I slowly zoomed out of the map. Voila! Most foreclosures that are for sale in the USA are now showing on your screen. Note: This map does not reveal any of the millions of REOs that have already been sold by the banks that hold them. But the maps do reveal an entire nation littered with foreclosure sales. It is an ugly and graphic depiction of how much inventory is out there, and why housing is stillmany years away from being healthy. Let’s try to zoom in and see exactly the extent of foreclosures in Florida, one of the biggest boom & bust regions. Zoom a bit more . . . Welcome to Miami! Let’s Go Shopping . . . On Miami Beach! The repercussions of the Housing boom & bust are likely to continue for years to come.